Class was in session at Axosoft headquarters during Phoenix Startup Week when founder of Pure Chat Hamid Shojaee spoke about metrics every Software as a Service (SaaS) firm needs to know to build their business and attract investors. Shojaee said none of these metrics help out a SaaS firm if they aren’t in the right market. Here’s a breakdown of the key components of SaaS metrics according to Shojaee. Conversion rate – What’s working and what’s not. Shojaee said the conversion rate is all about turning people who have traveled to your site into people who are downloading your product. And from there it’s about turning those people who downloaded your trial product into a happy, paying customer. A typical metric to look at is the number of people who download the trial out of the total number of people who have visited your site. And from there you can determine the number of converts from the free demo to the paid item. This number is done in percentages. If 100 people visit your site, and ten of them download the trial you have a conversion rate of 10 percent. Then from there only one of the people who downloaded the trial becomes a paying customer you have an overall conversion rate of one percent. The conversion rate lets you know what’s working on the site and how people become a paying customer. Shojaee considers this metric one of the most important numbers a SaaS company needs to effectively operate. This number is discovered by how much a customer pays per-month. If you have one customer paying $100 per-month, then you have a MRR of $100. Customers who pay annually, say $1,000 a year, they equate out to being a MRR of $83 per-month. To determine a company’s total MRR, you simply add the individual MRR’s from each customer until you have the total number. Shojaee said venture capitalists and investors have a high interest for the net MRR growth, or the rate at which the company’s MRR grows, to determine the success of a how successful the company is. Investors care about the growth of a company. This number is simply found by multiplying the MRR by twelve. 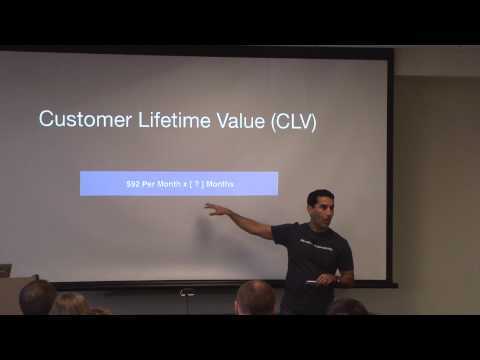 Customer Lifetime Value (CLV) – How much are your customers worth? This number is also very important, Shojaee said, it lets you determine how much a new customer is worth. It guides you to finding how much you should be spending to earn new customers. First you need to know the average revenue per user (ARPU.) When you divide your total MRR by two you’ll get the ARPU per month per customer. From there you multiply that by the average number of months a customer stays a customer. The average number of months a customer stays a customer is very difficult for a startup to know, but becomes easier as you collect data, Shojaee said. You can find out how long they stay a customer through attrition, Shojaee said, where you divide the number of customers that cancel by total number of customers. Knowing the CLV lets you know how much you can spend and lets you able to adjust prices and other factors, Shojaee said. Customer Acquisition Costs (CAC) – All about the ratio. This number is found by dividing the total costs of sales and marketing by the number of new customers. And it lets you decide what advertising is worth it and what isn’t. You’ll want to maintain a good ratio between the CLV and CAC. “You want this number (the ratio) to be greater than three,” Shojaee said. Learn more from local entrepreneurs at our Lunch and Learn, watch their talks here.